SANTANERO ZINE and the SANTA ANA COMMUNITY ARTIST(a) COALITION will be hosting the first Art Walk at the Art Alley /Callejon de Arte! 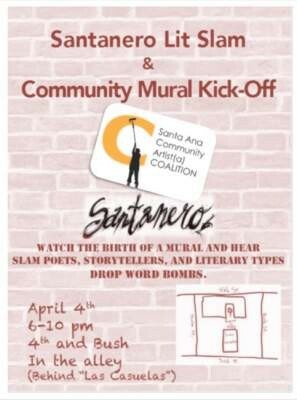 The SANTANERO Lit Slam and Community Mural Kick off! Community Artist(a)s will be creating temporary murals in preparation of the next big Community Mural. Hear the voices of the Community and their input about what kind of public art they would like to see go up in their City walls! Hear slam poets; storytellers, and literary types drop word bombs! This is the FIRST of many community engagement events the Santa Ana Community Artist(a) Coalition will be hosting in the Art Alley during the duration that it takes to complete a permanent Community Mural! Why is this mural important? As Downtown Santa Ana continues to undergo a number of important transformations, it’s essential that local residents and businesses take a role in the process and express their voices about the future of their city. With art taking an increasingly significant role in that future, art can serve as a powerful vehicle for community expression. Furthermore, the art creation process can be used to engage different communities, connect people, and actively participate in helping to change our community in the ways we want it to see it change. HOPE TO SEE YOU THERE! NOS VEMOS! Downtown Inc. and Alicia working together.